From the Fifteenth District by Mavis Gallant – Blog Tour & Giveaway! Even as we grow and change, the consequences of what we have left behind often linger. Mavis Gallant has a unique talent for distilling the sense of otherness one feels abroad into something tangible and utterly understandable. In this collection, she relates the stories of those stranded in relationships, places, and even times in which they don’t belong. In “The Moslem Wife” a woman is entrusted to look after a hotel in France when her husband is trapped in America after the breakout of World War II. As the situation progresses, the two grow in surprising and profound ways. In another tale, a German prisoner of war is released from France and returns home to a mother whose personality has been as irrevocably changed by the war as his has. In one of the most poignant entries, Gallant follows the life of a Holocaust survivor, illustrating how his experiences tint his outlook on life forty years later. With its wide breadth of subject matter and the author’s characteristic way with nuance, From the Fifteenth District is classic Mavis Gallant. This was my first time reading anything by Mavis Gallant, and because of that, I was not expecting her writing style. These aren’t stories that you can breeze through; you really have to take the time to digest everything because Gallant writes with some truly beautiful figurative language. The quote I cited at the beginning of this post is an example of the type of metaphors she uses throughout the nine stories included in this collection. Each story focuses on a different character living in Europe during the WWII era. Although these characters do not connect with each other, their stories all share the same themes and tones, the most poignant being a sense of otherness the characters can all relate to. One of the stories that particularly stood out to me was “The Four Seasons,” which follows Carmela, a young Italian girl living with an American family. She does not speak English very well and thus feels separated from her housemates. Even when she does gain a better understanding of the language, she pretends not to because by that point she has become too withdrawn from the family to develop an authentic relationship with them. I could relate to Carmela’s situation. When I was living in France, it was sometimes easier for me to pretend I was ignorant of the French conversations going on around me because that was easier to cope with than the awkwardness of cultural differences. 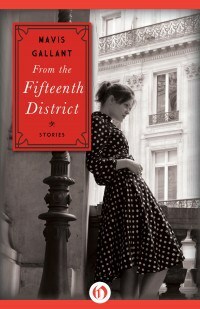 Each of the other characters in Gallant’s stories face this same type of displacement; some feel a distance from the people around them, others feel dislocated from their physical surroundings. …you enjoy short stories collections. …you like stories that can be read in one sitting but continue to stay with you long after you’ve finished reading them. …you feel drawn to historical fiction, especially fiction that takes place during WWII. …you’re touched more by books that are theme-driven instead of plot-driven. I’m reviewing From the Fifteenth District as part of a blog tour hosted by France Book Tours. Please click on the banner to read other reviews as well as an excerpt of the book. In 1952 Mavis Gallant (1922–2014) left a successful career as a journalist in Montreal to live independently as a writer of fiction in Europe. She had gained international recognition in 1951 when she was published in the New Yorker, which in subsequent years released over one hundred of her short stories, most of which are set in European cities or Montreal. Random House published twelve volumes of her work. Gallant was awarded the 1981 Governor General’s Award for Home Truths, the 2002 Rea Award for the Short Story, and the 2004 PEN/Nabokov Award for lifetime achievement. She was a companion of the Order of Canada, the country’s highest honor. After traveling widely in Europe, in 1960 Gallant settled in Paris, where she died in 2014. The Journals of Mavis Gallant: 1952–1969 is tentatively scheduled for publication by Alfred A. Knopf in 2015.